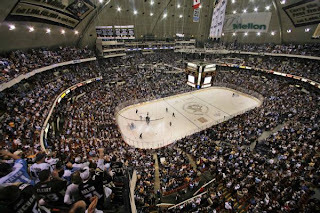 In front of many of the great Penguins of old, the Penguins of now closed out the final regular season game at Mellon Arena in style with a 7-3 win over the New York Islanders Thursday night. 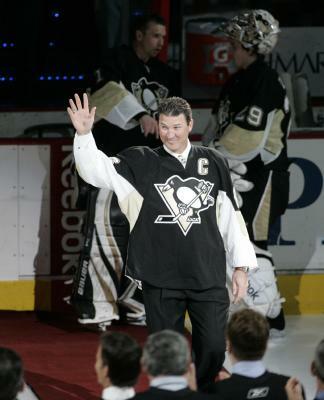 Many former Pens greats were in attendance for a pregame ceremony honoring all of the Penguins who have had noteworthy careers at Mellon Arena. 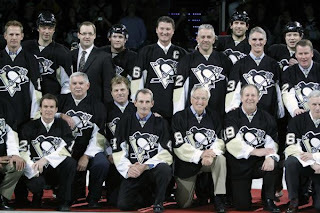 Each of the former Pens that were able to attend got individually honored as they walked out onto the ice for an eventual group picture with the current Penguins before the game began. Though I doubt there was a dry eye in the house after that ceremony (narrated by Paul Steigerwald and Mike Lange), the Pens still had to get down to business as there was an important game to be played. Brooks Orpik wasted absolutely no time doing so as he put the Pens on the board just 23 seconds into the game sending the igloo into an uproar and giving the Pens the lead that they would not relinquish for the rest of the game. Alex Goligoski kept the momentum going with a wrist shot powerplay goal off of a perfect pass from captain Sidney Crosby. The Pens then settled down for the next few minutes and allowed a goal from Matt Moulsen. They would not remain settled for long. Evgeni Malkin picked up the puck in his own zone with 5 minutes to go in the first and beat Martin Biron on a breakaway shot. Though this would have been enough to call a great opening period, they were still not done. With 58 seconds remaining in the period, Sidney Crosby got the puck in the zone and managed to slap one past Biron for his 49th goal of the season to put the Pens up 4-2 at the first intermission. The Isles got a rather quick goal to start out the second, but it would be the last they scored for the rest of the game. Sidney Crosby fired a wrist shot that deflected off Billy Guerin into the goal. It was initially celebrated as Crosby's 50th for the season, but further review after the game initiated by Crosby himself overturned the goal and gave it to Guerin. Guerin would get another one in the third period, giving him 21 and yet another 20 goal season. Tyler Kennedy also scored a few minutes after Guerin's first goal to give him 13 for the year. The game meant much more than just individual achievements and Mellon Memories, however. This win combined with a 3-2 regulation loss by the New Jersey Devils to Florida puts the Pens and the Devils in a tie for the Atlantic Division lead with two games remaining for each of them. (the devils do have the tiebreak, however) Most of the problems that showed in Tuesdays game were non-existant, as Fleury looked sharp (32 of 35 saves) and the Pens were able to generate momentum without problem. 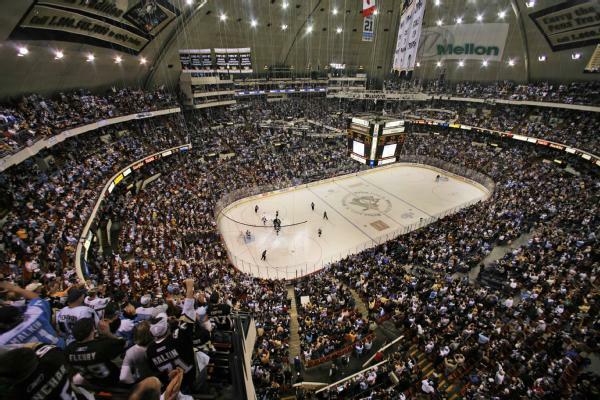 They played 60 full minutes of dedicated and inspired hockey and were rewarded for that work at the end with an incredibly long standing ovation that not only celebrated the Pens' win tonight but every Pens' win that was ever recorded in historic Mellon Arena. Evgeni Malkin returned to the lineup after missing the last game due to illness, however Chris Kunitz missed his second straight. Also, some "housekeeping details": Alexei Ponikarovsky was given a game misconduct after a contraversial boarding penalty. It was probably worthy of a penalty of some sort although it was clear that "Poni" had no intent to injure. Islanders goals were scored by Moulsen, Kyle Okposo and Josh Bailey. The Pens are now in a dogfight with the Devils for the Atlantic Division, with the Pens having the Thrashers and Islanders remaining and the Devils having the Islanders and the Sabres left. Saturday night, the Pens travel to Atlanta to face the disheartened yet ever dangerous Thrashers that were eliminated from playoff contention Tuesday night against the Devils. 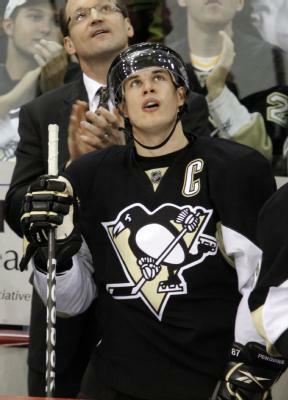 Sidney Crosby looks on after scoring what everyone thought was his 50th goal of the year, but he would later credit the goal to teammate Billy Guerin. 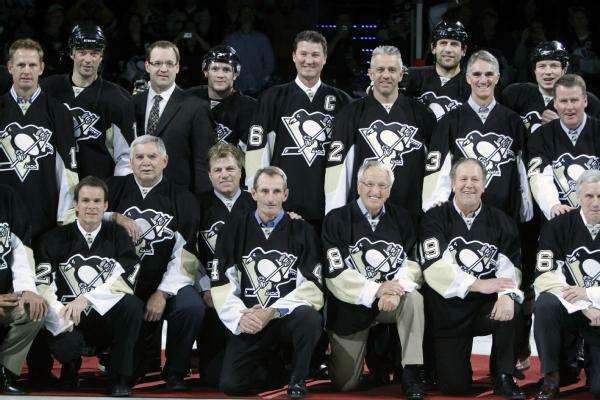 Past and present Penguins pose for a team photo before the game Thursday night. 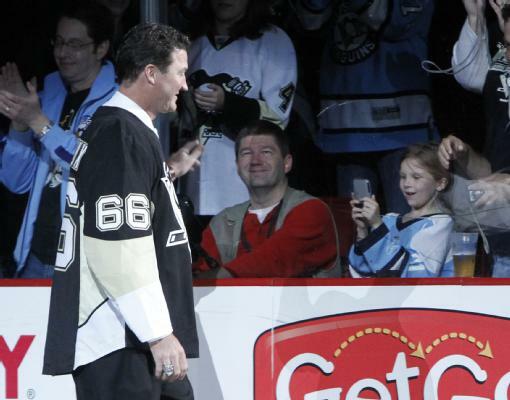 Penguins legend and current owner Mario Lemieux takes the ice to a roaring ovation from the sellout crowd before the game Thursday night. Another picture of Lemieux taking the ice. Evgeni Malkin and Marc-Andre Fleury celebrate after a 7-3 win. (note): the title picture is after Billy Guerin's first goal in the second period. As a Capitals fan, I'll be glad to see that place closed down. Not good memories.